So this is our first live report, and Kowezhi and Aoliwa are doing it together! From start to finish we’ll jam pack as many details as we can remember. Aoliwa: On Monday, November 16, 2009, Kowezhi and I set off for Chicago. This was our second Dir en grey show and we had a lot of high expectations. It would be a three hour drive to the Metro, the venue of the show. KWZ: Yup, I drove the whole three hours. We ended up arriving there with another three hours of waiting ahead of us. We pulled into a public parking lot (the very one next to that hotdog place) across from the Metro, and walked across the street to see that some crazy people had camped outside and there was already a decently long line. It wasn’t too cold at first, but with wind chill it was freezing! I eventually walked over to a nearby McDonald’s and bought some warm things to consume. ALW: Ok! So we met up with our friend Kelly, and it was finally time to enter the Metro. It took a little bit to get through security, but eventually we made it in. Willis and I found our way to the concert hall and meandered our way through the mosh pit. Through various pushing and shoving (not by us though… by people in the waaay back), we ended up being in the second or third row of people in the mosh pit. Yay for us! KWZ: Yeah!! It was great that we were that close. Anyway, the opening act was this weird band called “Digital Mindy”. I will give them this, they were better than last year’s opener, “The Human Abstract”. They had a sort of dark school uniform theme going on and they were all kind of on the fat side, but at least they did something…. Last year, all you could hear of the opening act was the bass drums. Absolutely NOTHING else. This time you could hear everything pretty decently balanced except for the bass guitar, which was inaudible. Oh right…. This being an all ages concert makes this funny: they had strippers come out and do some dancing for a couple of their songs. Aoliwa laughed about how when they came out, all the guys in the room would turn to watch them lol. They were really nothing special to look at… On with the music: I had no idea what the vocalist was saying in almost any of the songs, except i did manage to pick out some of their lyrics. I won’t bother mentioning what they were because they were just repetitive and bad. Overall, the opening act was… meh. All their songs sounded pretty much the same. Don’t bother checking them out. Please. We were at the Metro for DIR EN GREY! ALW: Ok so now it’s time for Diru!!! As soon as they came on the entire mosh pit lurched forward (this was how we got so close to the front!) As to be expected they entered the stage with Sa Bir in the background. The first official song they played was Vinushka. Not the short version either… the full 9+ minutes of epicness. I couldn’t believe the intensity of the song… Vinushka was flawless. Next up? Red Soil. We all know this is the third track from Uroboros. Kowezhi and I were right in between Kyo and Die, so we got to see a lot of Die’s technique here. He played with such great accuracy. Now we have REPETITION OF HATRED, the first track from their previous album, Marrow of the Bone. This song is a personal favorite of mine. This track is one of their heavier tracks and it’s great for lives. I couldn’t help but scream “dead passion!” along with everyone else. A favorite of both the crowd and Dir en grey, Agitated Screams of Maggots definitely had every one riled up. It got pretty crazy once this song started. I love hearing this song live because you can see that Diru really gets into it. Obscure, another of their well known songs was played after. Nice heavy song. It’s amazing to watch Kyo putting so much effort into screaming and just pushing himself to the limit. Damn good performance! I really wish I could see them more..
ALW: What I loved about this concert was the variety in both the members’ behavior and the setlist. We had songs from Uroboros all the way back to Vulgar. The members also did some unique things as well. Kaoru and Die shifted between 5 different guitars each; it just shows how specific they are about their sound. Along with water and towels, the stage crew also provided the band with beer. Toshiya opened his about two songs in xD. The crowd got excited and he waved back in acknowledgment. Alright, back to the show! The next few songs are all from Uroboros. Bugaboo has an interesting title… but it is one kickass song. You could tell Kyo was really in control of his vocals here. Now we have Toguro, one of my favorite songs from Uroboros. I love the guitar harmonies especially. Before the song, Die and Kaoru switched guitars again. On the album this song opens with some of Kyo’s soft vocals layered over one another in a very spiritual way. Throughout the show Kyo had been doing these Buddhist-like chants (recall the live version of Agitated Screams of Maggots on the Dozing Green single). That’s how Kyo lead into this song; it created an almost ethereal atmosphere. Yay now we have Glass Skin, the last single before Uroboros was released. Glass Skin is definitely on the softer side, as it opens up with a simple piano melody. This song moved the audience, and things slowed down for a bit. Glass Skin was the perfect lead in to the best ballad on Uroboros, Inconvenient Ideal. I was sooooo excited when they performed this song. Almost instantly everyone had their eyes on Kyo.. he began with very soothing vocals before he completely opened up with his raw and passionate vocals. Listening to this song was simply amazing. I almost cried here ._. ALW: Yay encore time! We only got 3 encores, but I think that was due to the fact that we got some really long songs in the setlist (props to Kaoru). The crowd was ecstatic when they started playing The Final, one of their best known songs. This song made me cry… again. It’s a very emotional song for both Kyo and the fans. KWZ: Their second encore was Kodou. This song is overall a bit softer than the other songs. It was great to hear Kyo singing for a bit. Also, it was a sort of break for the audience too. No need to jump around and scream lots. Towards the end though, when Kyo started the screams, the crowd followed suit. Gah, I swear that the fan girls hurt my ears more than their sound system! “Last song!! LAST SONG!” shouted Kyo. Dir en grey ended this concert with Gaika, Chinmoku ga Nemuru Koro. This fast-paced song was a great way to bring the show to a close. After our break with Kodou, we got to use up more energy with this. Frickin’ awesome! All of the band was going wild with this one. On a side note: At some point during the concert, Toshiya came over to our side and did his crowd provoking. We got to see him up pretty close too! 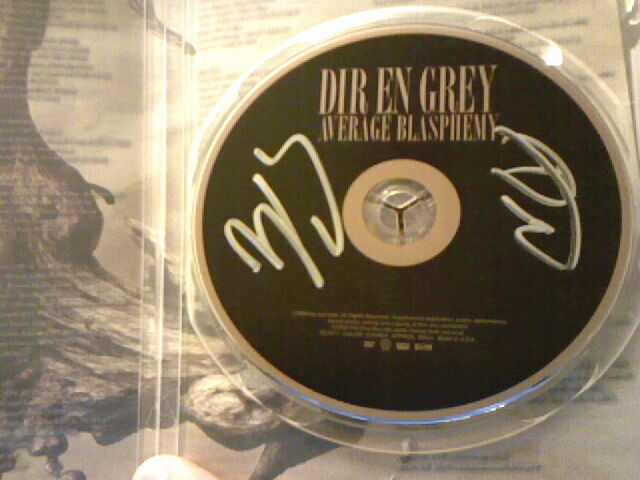 Yaaay for Dir en grey! !